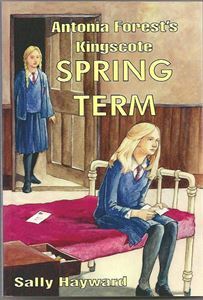 “Spring Term is set at Kingscote School in the months following Run Away Home. To Lawrie’s delight one of the events planned for an end of term Open Day will enable her to act, but she is bitterly disappointed at Miss Keith’s choice of play. Meanwhile Nicola’s singing ability is throwing her reluctantly into the limelight, and an exchange of letters between herself and Patrick, whose friendship might be developing into something more, causes more problems for Ginty than anyone could ever have imagined. Sally Hayward has read Antonia Forest since she was about 10 years old. She has gradually collected all the titles, some from GGBP, and has remained deep in them, ever since reading them. Spring Term has been edited by Tig Thomas, not only a professional editor, but for whom Antonia Forest is a major favourite, and has been copy edited by Laura Hicks who knows more about AF than most of us have forgotten. Spring Term also has the approval of Antonia Forest’s Literary Executor, Sue Sims. Tig Thomas comments: I’m very wary about continuations and my first reaction on being sent Spring Term to read was one of dismay. I didn’t believe anyone else would be able to do Antonia Forest’s style of writing and I didn’t want to wade through a substandard attempt. Then I started reading and relief spread through me. After two chapters, I was emailing Clarissa in my excitement to say that it was good and GGBP had to do the book. I felt quite simply as if I was being given a chance to learn what happened next in the Marlows' story. I woke up the morning after I’d read Spring Term with the warm feeling you get when something’s gone unexpectedly well with your world – I had read a whole new book about Nick, Patrick, and the rest, and I was still basking in the pleasure of it. Of course, as every Antonia Forest reader knows …The fate of these characters really mattered! What on earth happened next? How did Ginty fare when she returned from her bolthole? What were Patrick’s true feelings about Nicola, and how would he survive at ‘that terribly tough place’? Was Esther really to be cast into the outer darkness?